On Tuesday, February 27th, Vale announced its financial results for the fourth quarter of 2017. Financial highlights include net income of US$ 5.5 billion, which represents an increase of 38% compared to the previous year. The company ended 2017 with strong cash generation, measured by EBITDA of US$ 15.3 billion, 28% above 2016. “2017 was a year of consolidation for Vale”, says Chief Financial Officer, Luciano Siani Pires, in the video below. He highlighted three points that contributed to the positive results. First year of full operation of the S11D Eliezer Batista Complex, in Pará, Brazil. Vale's entry into the Novo Mercado, with unification of its share classes. Growth of 65% in market value. In operational performance, we achieved records in the production of iron ore, pellets, coal, and gold, also in the copper Salobo mine, in Pará. Even with rising costs and the appreciation of the Real, Vale’s sales margins have expanded. “Vale was acknowledged as the company with the most premium quality products in the market”, says Siani. 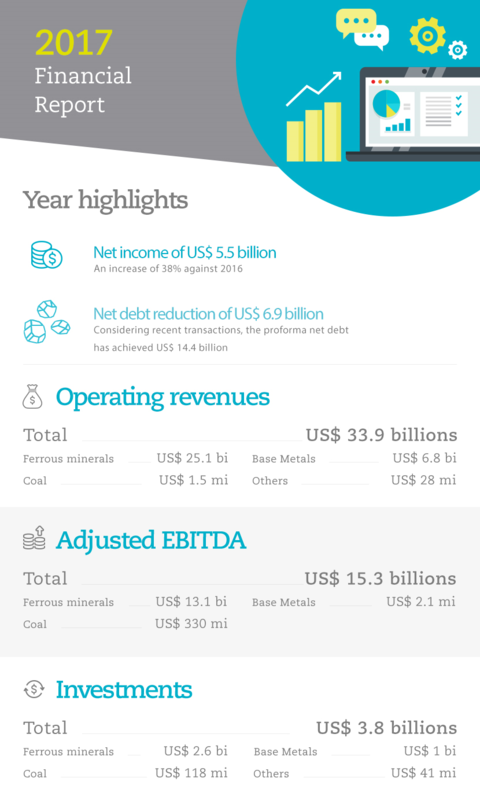 As a result of the good performance, the company managed to achieve one of its main objectives for the year: reducing net debt, which ended 2017 at US$ 18.1, a decrease of 27.6% compared to the previous year. Considering the sail of our fertilizer assets and the financial closing of the Nacala Corridor’s project finance, the pro forma net debt has reduced to US$ 14.4 billion. On Wednesday, starting at 10:00, CEO, Fabio Schvartsman and the Executive Directors will attend a conference with investors and journalists. Access the links below.